Oshiomhole, Ortom clash over Benue killings – Royal Times of Nigeria. 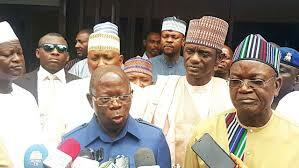 The National Chairman of the ruling All Progressives Congress, Adams Oshiomhole launched a tirade against Governor Samuel Ortom of Benue State yesterday, claiming that the governor is partly responsible for the security challenge in the state. Speaking with reporters in Abuja yesterday, Oshiomole said Ortom’s exit from the APC is a blessing in disguise. He noted that those that have been arrested as a result of the killings in Benue state are associates of the governor, including those he employed. The APC chairman added that instead of being worried about that fact, Ortom instead played up the ethnic dimension of criminality and sought to make political capital of the death of Benue people. He also accused the governor of non-performance and aggravating the level of poverty among his people despite the allocation accruing to Benue State, the bailout fund amounting to over twenty billion naira and the huge sums of money collected from the Paris Club refund. 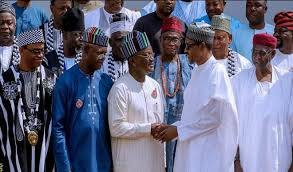 In a swift reaction, Ortom threatened to sue the APC chair saying Oshiomhole appeared to know more about the killings in Benue and is hiding the truth from Nigerians. He also dismissed allegation on non performance, saying that is double speak as Oshiomoles just last week eulogized Ortom as one of the best performing governors. He advised Oshiomole to concentrate on his job as party chairman.